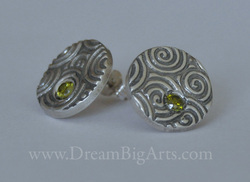 Uniquely classic, these fine silver discs have a repeating circular pattern and are accented with a glowing peridot. Sterling posts on these stud-style beauties! Perfect for everyday wear in a lovely color for spring.